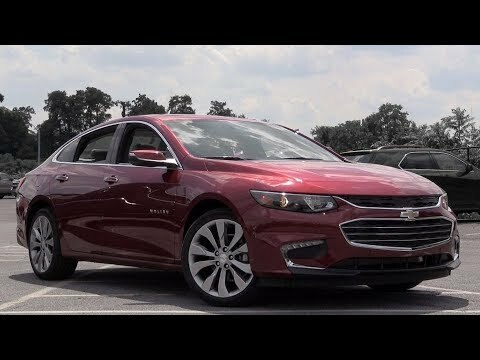 Chevy's midsize 2018 Malibu sedan has every advantage it needs to challenge rivals like the Toyota Camry, Honda Accord and Ford Fusion. A class-leading option roster that includes such must-haves as Apple CarPlay and Android Auto, automatic parking assist and adaptive cruise control, matches its first-class styling. An optional hybrid powertrain only serves to sweeten the deal. Again the most interesting detail of my car is the carplay option. My favorite feature of my car is the carplay. The reason I bought my car was because of the ability for me to have my maps visible on the car. That is the most convenient feature for me. The car play populates you phone screen on the car screen as well. Some apps it allow your car to connect to is music, texting, phone call, YouTube. It helpful because I do not have to look at my phone if I want to call someone or change a song. I think it is a good safety feature. Along with safety is has a back up camera. Which I love, before a backup camera I rarely backed into parking spaces but that is now my choice of parking. The interior is really nice, modern. A lot of space, especially in the trunk. It handle really well. My last car the steering wheel was loose. The car handles really well. I feel like I have good control when driving. The only part I dislike about my car is I feel like I have more blind spots. The rear view mirror seems to be in the way. It also come with OnStar which I have never had before either. It gives me a sense of comfort knowing I could get ahold of someone if I had any car troubles. Another feature I like is the dashboard behind the stealing wheel you can customize what aspect of your car you want to see. For example gas mileage available in relation to how much gas you have in your tank. You exact speed. I’d rather read my speed in a number vs judging my speed on the speedometer. It tells you as well when you need to get an oil change. That is a helpful feature to me as I am someone who tends to forget about my oil changes. Red 2018 Impala lt. Grey leather interior. Bose speakers. Lifetime warranty. I am a Chevy lover. I have owned two Malibu's, one Impala, and a Tahoe. I have enjoyed owning and driving all 4 vehicles. I have had very few issues that involve maintenance. The Tahoe had no recalls or service other then the oil changes and tire rotations. The Impala had an issue with the engine leaking oil, however the vehicle had over 110, 000 miles on it. My first Malibu I had for 4 years and I only had the service required to maintain the lifetime powertrain warranty and again I had no problems. I am currently driving a 2018 Malibu and I am in love. I have a grey leather interior package which looks and feels great. A spacious car for all shapes and sizes and is a no brainer option! Sounds like motor runs loud sometimes. Very smooth ride and is really fast. I enjoy that I am a bigger person but being in this car it really makes me feel like I have so much room. It is amazing how a change in the year of a car can make all the difference. My husband bought this car for me and I couldn't have picked a better one. The leg space is phenomenal for even someone who is 6 feet tall and will not have to worry about their knees touching because they can pull the seat all the way back and that is amazing.